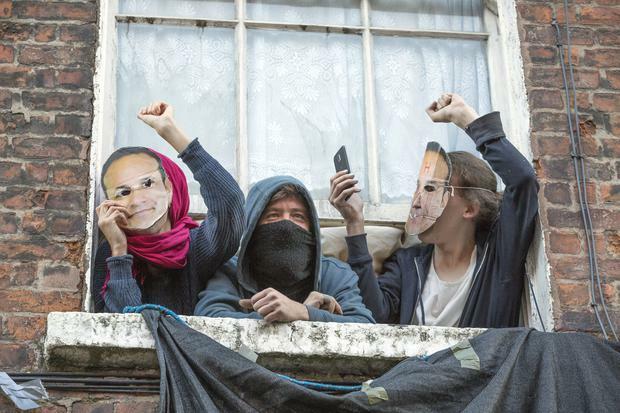 Squatters in a Dublin city centre property are to be served with legal proceedings demanding they leave and deliver up "vacant possession" to the owner. Barrister Padraig D Lyons told the High Court Friday that a group had forcibly entered a four-storey Georgian building at 41 Belvedere Place, Dublin 1 on 8th September and were still trespassing. Mr Lyons, representing MJH Property Management Limited, with an address in Middlesex, England, said his application was similar to court orders granted earlier by the court in relation to property in Summer Hill and North Frederick Street, Dublin. He told Mr Justice Anthony Barr he did not know if the group in occupation of the previously vacant Belvedere Place building was the same or were connected to the squatters controversially removed by hooded security guards and gardaí from the North Frederick Street property. Judge Barr granted MJH Property Management short service of the company’s intention to seek High Court orders directing the trespassers to vacate the premises and deliver up vacant possession. Mr Lyons told the court that certain developments had partially taken place to the two top storeys which, as a result, may be unstable. Judge Barr was also told by Carol O’Farrell, counsel for Dublin City Council, that a settlement had broken down between the local authority and a mother of three young children with regard to her leaving a house she had broken into in Coolock over a week ago. The Council had been seeking orders directing the removal of Ms Clare Elliot from the Coolock property together with her three children, the oldest of which is seven. Ms O’Farrell said Ms Elliot had been made an offer of emergency accommodation but negotiations with her had broken down. She asked that the proceedings be put into next Tuesday’s High Court list.